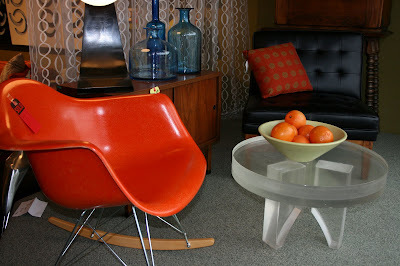 Guide to San Francisco's Mid Century Modern furniture shops. 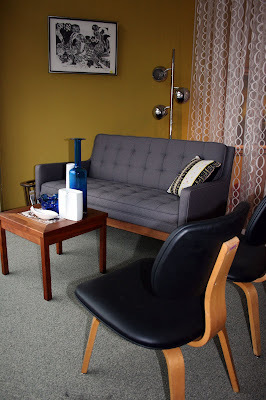 Crash-course guide and review of Mid Century Modern furniture stores in San Francisco. Includes high-end dealers on down to vintage thrifts. Ground covered includes the city proper and East Bay. Antique mall of your mod dreams. First of two Past Perfect stores. Just a few blocks apart. I walked it. May seem smaller from street level than its Lombard St. counterpart. Don't be deceived. Loaded with well-inventoried dealers. Likely to find everything you need, and a few things you didn't know you needed. Friendly and knowledgeable staff hang out to rock your world. If you only have two hours to kill, both Past Perfects are your must stop. Cavernous home to large Mid Century Modern items. Second of two Past Perfect stores. Huge space. Fewer accessories. More couches. Equally friendly peeps. Can't hit one Past Perfect without hitting the other. Just wouldn't seem right. Hardwired hanging clock was insanely cool. Holler if you know the designer. Was shaking in the presence of Eames. A 1stdibs dealer. 1stdibs is a word known to strike fear into checkbooks across the mod lands. Jeff however is extremely approachable and knowledgeable. He's quick with a joke or to light up your smoke. Wait. That's a song. Decompress. Back on track. Farnsworth is fairly small but contains carefully selected pieces showing pride and appreciation for good design. Now I'm not saying it's not expensive. It is. But it's equally nice and friendly. Working man's Danish modern mecca. Shop seems to go on for days. Two large rooms create a sea of Danish credenzas serving as lifeboats to mid-mod odds and ends. Great source for lighting, art and period electronics. Most everything is reasonably priced and topped with friendly service. Haphazard stacking begs you to make sure you look under and through stuff. Don't miss something great. Museum in which you can buy anything you want. For a price. Another 1stdibs dealer. Currently maintaining two spaces - across the street from each other. One serves as main shop. Other serves as by-appointment-only vault of untouchable goodies. Make no mistake, main shop is full of museum-quality, mostly unaffordable treasures too. One may think this shop would carry a level of pretentiousness. It mostly doesn't. Staff was very inviting and conversational. Have good taste and a wallet to match? This is indeed your spot. Pocket-sized treasure trove of 20th century goodness. Shop is tiny. Yet vast. Wall to wall exploration of 20th century trinkets, knick knacks, clothing and furniture. Owner Mark knows how to pick a staff. One of the nicest employees encountered on our adventure. The "hello" in the hello [at] room4.com email is a true indication of their friendliness. At first glance your eye may not know where to focus. Squint and you'll spot an extremely affordable Saarinen-style tulip side table floating mid-pic. While you're already in The Mission - why not? Decent shop with plenty of inventory. Best for picking out odds and ends. Won't find highly sought-after name brands but will find plenty of opportunities to discover something workable for your vintage space. That said, I did spot a pair of Russell Woodard patio chairs in the window for an easily digestible price. Rock-on. Need odds and ends? On a budget? Look-for-less? 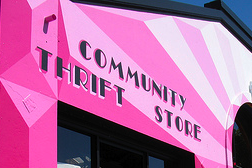 Welcome to Community Thrift. You won't find a mint Saarinen chair but you will find a cool desk in need of a little refinishing. Place is huge and plenty to sift through - from clothes to furniture to glassware. Cool brand story. Portion of proceeds go to charity of donor's choice. Over 150 charities to choose from. Give and take. Nice. Swanky three-arm bullet light was $7.00. Whole corner of vintage electronics and light fixtures. Super cool danish two-piece couch. Reminiscent of Kofod Larsen. Was $350 for both pieces. Currently X21 is closed. Rumors on Valencia St. say they're re-tooling with plans to open again soon. Attempts to contact owner were unsuccessful. Not a fan of un-returned phone calls. Space occupied is large and could again be filled with Mid Century Modern sweetness. Worth keeping an eye on. Slightly pretentious. But not in a bad way. Space is somewhat limited but every inch is filled with high-quality mint condition pieces. There's a sense you won't find any "deals" here, but if you want it show-ready this is the spot. Hard to find a reason to leave. This place is the real deal if you're hunting Danish Modern. Owner Lynne is super passionate and super friendly. Lynne travels to Denmark every 3 months. Loads up a shipping container with 300+ items and sends them on their way to Cali. She meets them on this end and sells them to you at reasonable prices. Sweet. If you're looking for something specific, ask her. She'll keep an eye out on her next visit overseas. If you need that missing chair to round out your collection they most likely have it. Cado systems are always on Lynne's radar. They've sourced original fabrics. This means if you need a chair recovered you get to stay original-ish. This vintage Louis Poulsen PH 4/3 now hangs in our dining room. Revelation to come later. Totally dig this place. Architectural salvage at its finest. If you find yourself restoring a Mid Century Modern home in or around the Bay Area, you must hit this spot. Often. Prices range from fair to down right cheap. Their mission is an altruistic "green-by-reuse" one. I like that. Large collection of vintage appliances. Assorted furniture. Found a sweet vintage TV. Don't recall how much but certainly recall thinking, "good deal". Large selection of original cabinets. Found a complete set with whale tail pulls. Asked if I could buy just the pulls. Notion was harpooned. Lots of chairs. This Steelcase chair was $14.99. Just saying. Doors go on for days. Several long aisles inside and out. Nearly certain a few Eichler doors are hiding in these rows. Vintage medicine cabinets. Seriously considered plotting a method by which to transport this home. Was only $25.00. Outside brings a sea of toilets. In any other circumstance this would be bad. Need a pink, blue or yellow toilet/sink/tub? They've got them. Lots of them. Short search led to finding at least half a dozen near-mint Crane Drexel hardware sets. Pretty popular among the MCM kids these days. And supposedly hard to find. Not here. We're so cool. No really. We are. Visited while they were closed. Store seems small with a mix of new and vintage. Emails to owners for additional images and information were un-returned. Not a fan of unresponsiveness. Oh well. Hit this spot on a closed day. Saddened. John, the owner's husband was very responsive on both phone and email. Super cool and super friendly. Would have made it back out here if it weren't for the Bay Bridge closure during my stay. Boo. If you're looking for a shop with friendly people and a great selection of hand-picked Mod, this is your spot. Eames rocker greets passers-by from front window. My face-print may be visible from me peering inside. Yum. Below images were provided by Katie, Retro's Design Assistant. A little more Eames rocker rock'n for ya. Plenty of knick-knack joy to pick through. If you know of other stores, post a comment with details. thanks for the tips on the east bay stores. i live in sf one block off Valencia st., and have frequented all the $$$ mcm shops.and yes, x-21 is currently out of commission, they always had killer window displays. but it looks like some killer deals to be had at urban ore, i have never been there. Thanks to this post, we are now considering moving to SF. Why can't we have a selection like this in Seattle. I would be totally mad at you for posting this if I weren't going to be in SF at the end of next month. Looks like we're going to have to tack on an extra day for shopping! So excited. Love the thrift finds! Awesome, way awesome. And way to post about SF on the same day as me. We're geniuses. 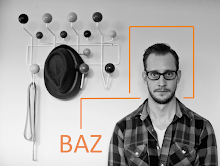 Great summary, Baz. You certainly had a productive trip here! Sorry I missed you. Missing: Trout Farm and Modernaire in Berkeley and Modern Past in Glen Park. Oh one more: the exquisite Form Vintage Modern in Rockridge. Pardon my bad link, I'm from The Mid-Century Modernist. Anything else come home with you besides the awesome fixture? Wow, great list. Thanks. I didn't know there was a second Past Perfect, I will have to check that out. Another good shop is The Modern I in San Anselmo. The website doesn't seem to have updated to their new location: http://www.eamescollector.com/, but they are currently at 530 San Anselmo Ave., San Anselmo, CA. And thanks to @mid_century_mod for sending me your way. fabulous guide. now I need to take a trip into the city. I want that hi-fi. badly. "The Apartment" at 3469 18th Street is also worth checking out. 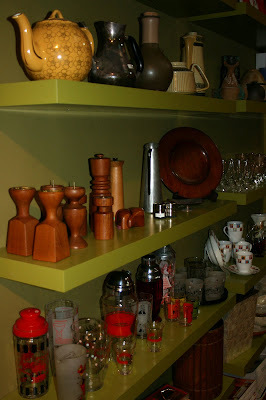 Lots of vintage, both mid-century and more, and interesting artwork and knick-knacks. this is a great guide, thanks! anyone know of the name of some places in the south bay? I recall there being a place in some fancy south bay neighborhood. Also I can't agree more about the folks at retro at home. 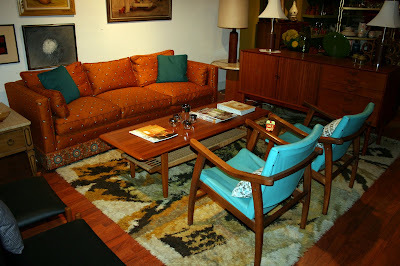 they are the nicest most pleasant people ever with a real love for mcm furniture and art. I have to also mention that the alameda antique market is a good place to go for some good finds. This is such an amazing list! I need to hit up all these places in SF this weekend. I am in search for a store that I drunkenly passed by in the Mission and I think I was on Valencia (due to the notes of hipster in the air) and somehow it lead me to your wonderful guide. I am still looking for the store with the tree stump coffee table. 5 years in the waiting... One day my stump will come. bedroom and bathroom furniture from mid-century modern house any ideas? Where could I sell some built-in bedroom and bathroom furniture from a mid-century modern house? I think the shop you may be thinking of was on Guerrero at 14th. Towards the end he was doing this kind of, I don't know, 1950's modernist Montana hunting lodge?? >He was friends with the guy at Farnsworth. I have just moved to Mendocino County and this is great info - I can't wait to get down to SF and visit these shops. Do you have a similar list for Santa Rosa or anything farther North? Thanks!